Couch to Quilt™ — Missouri Star Quilt Co.
You won’t believe what we’ve got in store for you. Nestled inside the Couch to Quilt box is an array of quilting goodies, handpicked just for you. 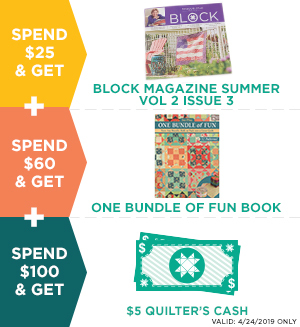 You’ll receive $250 worth of goods and services, including machine quilting and binding! As soon as Couch to Quilt arrives, all you have to do is open up the box and begin. Follow along with the booklet and a series of short online tutorials to help you through the process. Jenny Doan, YouTube’s top quilting teacher, will be right there with you, helping you along the way. After you get your quilt top sewn together, all you have to do is mail it back to us and our fabulous Machine Quilting Department will take care of the rest! They’ll finish up your beautiful creation on a professional longarm quilting machine, and even bind your quilt for free! We think you’ll be amazed at what you can do when you put your mind to it. Couch to Quilt teaches you the process of making a patchwork quilt from beginning to end. When your quilt’s all finished, give it to someone who will love it, or keep it yourself, you deserve it! Q What kind of quilt am I making exactly? A It's a beautiful baby quilt that will measure about 30x35 - perfect for a little one. Q I’ve never made a quilt (or even sewn a stitch) before. Can I do this? A Of course you can! We believe in you. Everything is included to help you make your first quilt. The booklet and online tutorials will guide you through each step of the process, from using your rotary cutter for the first time to sewing the last stitch in your quilt top. Q I'm an experienced quilter, is this kit for me? AThis kit is designed for beginning quilters, especially those who have never tried quilting before or have struggled to succeed. However, you might enjoy a fresh set of tools and the simple quilt kit with machine quilting included, but it won’t be a challenge. If that’s what you’re looking for, we can give you some ideas! Q Can I choose the fabric that's in my box? AThis edition of Couch to Quilt includes a lovely charm pack called Basic Pastels. We’re sorry to say that it can’t be substituted, but we think you’re going to love it! It would make a beautiful lap quilt or baby quilt. Q Are the supplies worth the price? AMost definitely! You won’t find prices like this anywhere else. We’ve handpicked high quality supplies from the best brands for this box. For only $99.95, you get $250 worth of supplies and quilting services. What a deal! Q Is the machine quilting really included? AIt sure is! We think you’re going to love this feature. One of the first hurdles beginning quilters encounter is how to finish their quilt. We’ve taken the worry out of that step and by the end, you’ll receive your quilt, professionally finished, with binding too!